The Delphian Literary Society was founded January 14, 1905, and was a non-secret organization for men and women. Its purpose was the development of literary ability and the fostering of good fellowship. The meetings were first held in Kirkwood Hall. The Delphian men first obtained a furnished house at the northwest corner of Sixth Street and Indiana Avenue. In 1910 they rented a house at 202 East Kirkwood Avenue. They occupied this house for two years. In 1912 the men rented a larger house at the southeast corner of Seventh and Washington Streets, and occupied it until the fall of 1916. The literary meetings were held at this house as long as the Delphian Club was in existence as a co-educational organization. The Delphian colors began as apple green and purple in 1905, but by 1906 were old gold and gray (variously called silver or steel gray). Their motto wasFinis Coronat Opus (The end crowns the work). Bessie Gutherie, a classmate of Chester A. Amick (AI Roster #6, Dalethian in 1917, Dalethian House Jazz Pianist) from the Columbus High School class of 1913, became a member of the Delphian Literary Society. In 1915 the men of the Delphian Literary Society formed the Dalethian Club, which, at that time, was the only local men’s club at Indiana University. The women retained the name Delphian. At the time it was generally understood that all male members of the Delphian Club were considered members of the Dalethian Club. Shortly after its foundation the membership was extended to students of the other colleges and departments of the University, and the Club began to assume the aspect of a local fraternity. Although the colors of the Dalethian Club were old gold and steel gray, the pin was a black shield, on which a Phoenician Delta was engraved in gold and mounted on a golden equilateral triangle. The charter members of the Dalethian Club were: Virgil French (AI Roster #53), Edwin Terrell, Lertie Madison Hylton (AI Roster #3), Arnett H. Owen, Ernest D. Wade, Lloyd D. Waid, Lawrence E. Henderson, Cecil P. Clark, Maurice V. Kahler, Verne E. Washburn, Ralph Ruddell, Herbert A. Smith (AI Roster # 2), Vernon D. Brigham, Maurice Hughes, Lowell S. Martin, Lee R. Kellam, Freeman Hinds, John K. Lanahan, Claude E. Curry, Luther D. Davis (AI Roster #46), George W. Capouch, and Ansell LaFollette. In the fall of 1916 they moved to 312 North Washington Street into a larger and better house. The year 1916-1917 was a prosperous one, but that was soon to change. In the fall of 1917 there were only two or three members of the Dalethian Club on the campus as other members had gone to war. Because a large number of its members had entered the service, the organization did not open its doors at the beginning of the fall term of 1918 and their house was taken over and used as barracks nº 13 by the Student Army Training Corps. The Dalethian Club ultimately ceased to function until the winter of 1919-1920. While assigned to the Army of Occupation in February 1919, Chester A. Amick met George Starr Lasher, Alpha Gamma, ‘11, University of Michigan, who would play a prominent role in Alpha Iota Chapter. Two years later when the war was over, only three initiated members of the Dalethian Club returned in the autumn of 1919 Walter A. Wise, Lertie M. Hylton and Chester A. Amick. Two pledges also returned, J. Edwin Purple (AI Roster #13) and George Buchanan. They found, much to their chagrin, that during the war period the rent for the clubhouse on North Washington Street had not been paid, the owner had appropriated all the furnishings in lieu of the unpaid rent, and the clubhouse was occupied by the Phi Mu sorority. The Dalethian Club had disappeared from the campus. During the fall semester of 1919, several discussions were held concerning the possibility of reviving the Dalethian Club. Jasper A. Reynolds (Alpha Iota Roster # 8) and a few other brothers got together, pledged, and initiated some new men. There were problems three members, no money, no house, no furnishings, and two pledges. Furthermore, some of the people had not been on campus for a couple of years and were not too well acquainted with the student body. Gradually, however, possibilities developed and they decided to give it the old Hoosier try, and thus the Dalethian Club was restarted. As is well known, a fraternity needs members, many of them. This problem was met by first initiating the two pledges. One of the five lived on Indiana Avenue, address unknown. This seemed to be a convenient spot for “pledge meetings” and, immediately they started “rushing” men they knew and respected, mostly upperclassmen. They met at the Indiana Avenue house each Sunday afternoon and usually succeeded in obtaining one or more pledges. As the number approached twenty, it was decided that they were in a position to look for a house. Again, fortune smiled on them and in the spring of 1920 they leased the William N. Showers house at 416 North Walnut Street. The necessary furnishings were obtained to enable them to move in at the beginning of the second semester. During the spring of 1920 they enjoyed their new home at 416 North Walnut Street(between Eighth and Ninth Streets), and, although they were deeply in debt, they were satisfied with the progress they had made. However, it was evident that if they were to compete with other fraternities on the campus for firstrate material it would be necessary to be affiliated with a firstclass Greek letter fraternity. After considerable discussion, it was decided to petition Theta Chi Fraternity and this was done in May 1920. The names of the petitioning members were: Chester A. Amick, Harold E. Curry, Clarence O. Davisson, H. H. Davenport, Emil W. Fisher, Edmund B. Haggard, Lertie M. Hylton, S. Clyde Lacey, Dewey E. Mannan, Arlow R. Pifer, J. Edwin Purple, Jasper A. Reynolds, Gilbert D. Rhea, Virgil D. Reed, Wilbert B. Rhinehart, Roy E. Shanks, Wendell A. Shirley, James F. Slack, Leslie E. Smith, Donald F. Teeters, William G. Thomspon, Donald C. VanHoy, J. Byron Walker, Kelsie R. Warne, Robert C. Waters, William J. Waters, Jesse L. Weaver, Russell E. Wise, Walter A. Wise, Eldo W. Wood. 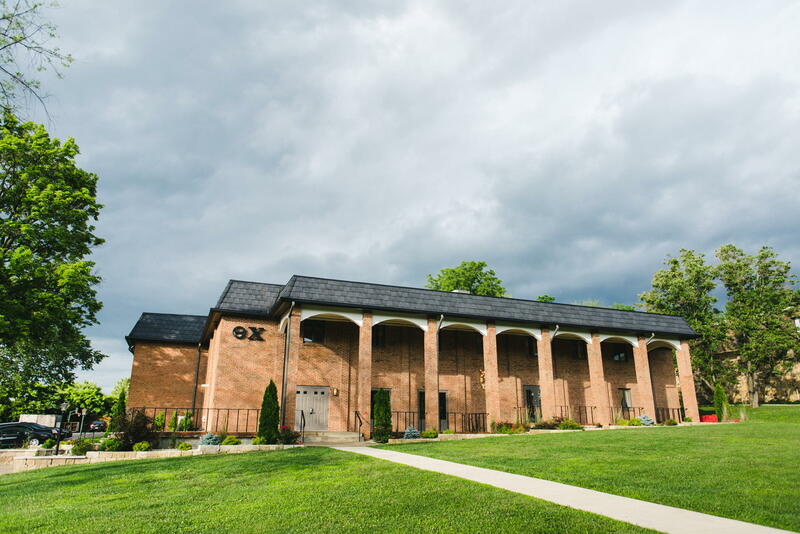 One day that summer, a letter was received from the Grand Chapter of Theta Chi informing them that a representative was being sent to visit them and make an appraisal of the group. Shortly thereafter, a letter a day began to appear in the morning mail addressed to a stranger to the men. The name on the envelope was George Starr Lasher. Upon his arrival in the fall the men oriented him to their organization and the campus. It was a good visit and the men corresponded with Theta Chi throughout that fall and winter. Brother Lasher was a graduate of the University Michigan, 1911 that had been president of his chapter, and in 1931 became National President of Theta Chi Fraternity. The fateful meeting with Chester A. Amick in 1919 now had meaning. The Dalethians held their last initiation on February 25, 1921, initiating Maurice Barton (AI Roster #33), Lawrence Carlson (AI Roster #45 who served in General Assembly 1925-1928 and State Senate 1935-1942), Samuel Schlosser, Jr. (AI Roster #31), Carl Zink (AI Roster #49), Wyatt May (AI Roster #44, “I” man in track), Earl H. Chaney (AI Roster #29, “I” man in cross country and track), Charles Stouder (AI Roster #50), Alfred Geyer, Jr. (AI Roster #39), Everett Scott (AI Roster #34), Lewis Pettit (AI Roster #28), and Allan Warne (AI Roster #37). The Grand Chapter of Theta Chi Fraternity granted a charter to the men of the Dalethian Club on February 1, 1921, and plans were set in motion to install the group as a chapter of Theta Chi Fraternity. Three groups were scheduled for installation on the weekend of March 1819, 1921 and simultaneously became chapters: Alpha Theta, Dartmouth College, Alpha Iota, Indiana University, and Alpha Kappa, West Virginia University. The men most instrumental in securing the charter for Alpha Iota were J. Edwin Purple, Emil Fisher and Lertie Hylton. An informal smoker was given at the Dalethian chapter house on Friday evening March 18th 1921 for the Dalethian Alumni and the visiting members of Theta Chi. George Starr Lasher acted as toastmaster and short talks were given by various members of Theta Chi and Dalethian. The installation started the next morning, Saturday, at 8:30, and with the exception of a recess of one hour, for lunch, lasted until 4:30 in the afternoon. The Grand Chapter installation committee consisted of: C. A. Schwier, Alpha Delta, G. S. Lasher, W. H. Granse and E. E. Dreese, Alpha Gamma. Other visiting members of Theta Chi assisting with the installation were: Dr. G. C. Brandenburg, G. F. Isley, and H. S. Jones from Alpha Delta along with A. W. Schmoeller and F. W. Messing from Rho. Sixteen alumni and 29 undergraduate members were initiated on March 19, 1921. Following the installation a formal banquet at the Blue Lantern Café (108 E. Kirkwood Av) was held in honor of the visiting members of Theta Chi and the Grand Chapter. Roy E Shanks, Alpha Iota, acted as toastmaster and short talks were made by Arthur Schmoeller, Rho; George Starr Lasher, Alpha Gamma; Dr. William Lowe Bryan, President of Indiana University; John W. Cravens, Registrar of Indiana University; C. M. Hepburn, Dean of the College of Law, Prof. B. D. Myers, Secretary of College of Medicine; S. E. Stoute, Dean of the College of Liberal Arts, and Horace Hoffman, past Dean of the College of Liberal Arts. Immediately following the banquet, a formal dance and reception, lasting until midnight, was held in Assembly Hall, a campus building, and was attended by approximately one hundred and fifty couples. The hall was appropriately decorated in Theta Chi colors. The names of the forty-five Charter Members of Alpha Iota Chapter are: Emmett Wallace Arnett, Chester Albert Amick, Maurice Sturat Barton, James Hannan Butler, Lawrence Edward Carlson, Earl Hubball Chaney, Herman H. Davenport, Clarence Owen Davisson, Bert Edward Ellis, Emil William Fisher, Alford B. Geyer Jr., Edmund Brown Haggard, Russell Prichard Harker, Lertie Madison Hylton, Wendell H. Kinsey, Sherrill Clyde Lacey, Wyatt Eugene May, Charles Owen McCormick, Lewis Roy Pettit, Arlow Ray Pifer, John Edward Purple, Vergil Daniel Reed, Jasper Andrew Reynolds, Gilbert D. Rhea, James Conrad Rhea, Wilbert B. Rinehart, Samuel Schlosser Jr., Everett Vernon Scott, Roy Edwin Shanks, James Foster Slack, Herbert Alonzo Smith, Leslie Gordon Smith, Harold Seigel Spencer, William Glenn Thompson, Donald C. Van Hoy, Gordon Austin Vizard, James Byron Walker, Allan Henderson Warne, Kelsie Raymond Warne, Robert Clarence Waters, Wray Randolph Waters, Jesse Lumpkin Weaver, Russell Edwald Wise, Walter Andrew Wise, and Eldo W. Wood. In the spring of 1922 Alpha Iota moved to 420 South Fess Avenue (between Atwater and Hunter Streets), where they initially rented a house, which was occupied by 35 members. The home was previously leased, since 1914, by the Pi Beta Phi sorority. On March 17, 1922 the men hosted an informal 12 o’clock house dance at the chapter house in honor of the first anniversary of the local chapter; Hoagy Carmichael’s orchestra furnished the music. The Theta Chi Building Association, a non-profit domestic corporation was created on May 8, 1923. They purchased the house on South Fess on January 26, 1925. On June 12 & 13, 1925, property in the Varsity Place Addition was purchased, and building was begun on the 101 North Jordan Avenue house. Within a year’s time, no less than ten fraternities and sororities purchased lots and built homes in the vicinity of Alpha Iota’s Chapter House. As a result, the chapter occupied a magnificent Georgian home squarely in the center of “The Fraternity Quadrangle,” with emphasis on the “THE”. The Fess property was sold on June 28, 1926 to Beta Sigma Omicron, a new sorority on campus (This house sustained $15,000 worth of damage due to a fire on September 24, 1928). When the fall semester began, their new house was not available, so the brothers lived temporarily at the old Kappa Sigma house1 until they moved into their new home on November 6, 1926. The men had great pride in their new home and continued to prosper. A fire at the 101 N Jordan house on March 30, 1928, believed to have started by spontaneous combustion in a wardrobe of one of the rooms on the third floor, caused about $800 damage. The loss was fully covered by insurance. Alpha Iota Chapter moved to the new house at 1440 N. Jordan Av. in the fall of 1969.